On the eve of the deadline for political parties to present their lists to the Knesset, United Torah Jewry on Wednesday finalized the names of the candidates who will be running under the party's banner. The list will be led by current Deputy Health Minister Ya'akov Litzman, followed by current Chairman of the Knesset Finance Committee MK Moshe Gafni. Third on the list will be former MK Meir Porush, followed by MK Uri Maklev, MK Menachem Eliezer Mozes, MK Yisrael Eichler, and Bnei Brak Mayor Ya'akov Asher. United Torah Jewry, which represents the Hareidi Ashkenazi (European origin communities) in the Knesset, is made up of two political groupings – the “Lithuanian Yeshiva” oriented Degel Hatorah, and the Hassidic-oriented Agudat Yisrael. The two parties, which haven't always seen eye to eye, merged several decades ago, after fears that two separate Hareidi parties could not garner enough votes apiece to pass the minimum number of votes for a party to enter the Knesset. Candidates for the Degel Hatorah faction are chosen by the Council of Torah Sages, which represents the heads of Yeshivas and dominant rabbis in the Lithuanian yeshiva community. 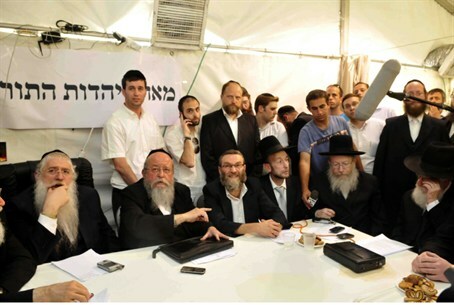 Agudat Yisrael's list emerges after negotiations between the various Hassidic groups, with each group presenting its preferred candidates and a list set, based on the size of the group, as well as political horsetrading. The list is dominated by Gerrer and Vizhnitz Hassidim, with a smaller representation by Belzer Hassidim. However, the largest Hassidic group in Israel – Satmar – does not set forward candidates for the list, as they are ideologically opposed to the idea of a secular Knesset running Israel. In order to prevent disputes this election, MK Yisrael Eichler, the representative of Belzer Hassidim, agreed to vacate the sixth spot on the list to Degel Hatorah's Asher. Polls show that UTJ is likely to get six seats in the next Knesset, making the seventh slot “unrealistic.” However, sources in the party said that there is likely to be a rotation between the two at some point, with Eichler taking the seat and Asher stepping down. In the current Knesset, the party was led by Degel's Gafni, who had taken over for Agudah's Litzman, who had led the party in the previous Knesset – and with the elections coming up, Litzman is again taking his “turn” as head of UTJ.